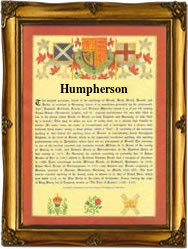 Recorded as Humphreys, Humphries, Humphreyson, Humpherson, Humphrieson, Humpherston, as well as many others, this is an English and sometimes Scottish surname, of French origins. It is derived from the pre 7th century Germanic elements "hun" meaning a bear cub, and "frid" meaning peace, a strange combination of elements even for the Dark Ages. St. Humfrey the 9th century bishop of Therouanne in France, had a certain following in England amongst the Norman settlers, and this no doubt contributed to the popularity of the name. Interestingly, until the early 14th century, the name appears to have been confined almost entirely to the nobility, and to the learned sections of the populace such as scribes and scholars in great houses and monasteries. As a personal name it first appears in the Domesday Book of 1086 as Humfridus. In the later examples of the surname from about the 13th century the suffix "-s" when used is the short form of "son of". Early examples of the surname recordings include William Umphrey in the Staffordshire rolls of 1293, and Roger Houmfreys in the 1311 pipe rolls of the city of London. The development of the full patronymic is later and includes examples such as Thomas Humphreyson who married Sarah Godby at St James church, Dukes Place, Westminster, on July 25th 1698, and Heather Humprison who married Ben Simcoe at St Giles Cripplegate on June 12th 1721. The first recorded spelling is probably that of William Humphreys. This was dated 1240, in the Fines Court rolls of Bedfordshire, during the reign of King Henry 111rd of England, 1216 - 1272. Throughout the centuries, surnames in every country have continued to "develop" often leading to astonishing variants of the original spelling.